In the late 1980's Paris Manufacturing, a well known century old manufacturer of wood sleds and toboggans, decided they needed a line of products to sell in their "off" season. 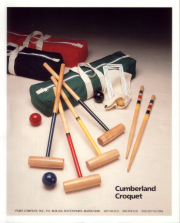 Croquet seemed like the perfect item and the "Cumberland Croquet Set" was born! True to their reputation for quality and craftsmanship the Paris Mfg. company had much success with this croquet set and it didn't take long for that set to evolve into several different models. All of these models have the same inherent quality that Paris Mfg. was known for. 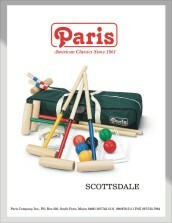 For several years the Paris Co. continued to produce these high quality croquet sets for many of the major retailers including Land's End, Lee Valley, L.L. Bean, Orvis, Plow & Hearth and Pottery Barn. While receiving favorable reviews from the Wall Street Journal on more than one occasion, the pressure from offshore manufacturing began to erode away at the Paris market share. 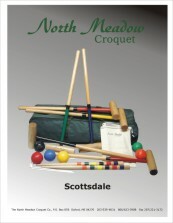 The imported sets were less expensive, less durable and generally inferior in quality when compared to these domestically manufactured croquet sets. Some of the major retailers opted for the imported sets and the Paris Co. began to falter. Fast forward a few more years and due to the offshore pressure, the manufacturing of the wood sleds and toboggans along with the Paris name was sold to a Canadian company. However, the croquet line was retained by the parent corporation and marketed under the name of Forest Industries, Inc., a Maine manufacturing company that had been furnishing the wood turnings for these croquet sets. It was about this time that Pierce Point Laser entered the picture when they created the personalized croquet set market. It wasn't long before Pierce Point was purchasing about one in four of the sets they were producing. It was a natural progression that with their capability to personalize and engrave corporate logos on these sets that Pierce Point Laser acquire this line of croquet sets. In March of 2008 this happened and The North Meadow Croquet Co. was formed. With Pierce Point Laser's guiding principles of quality, craftsmanship and customer service the future bodes well for North Meadow Croquet.